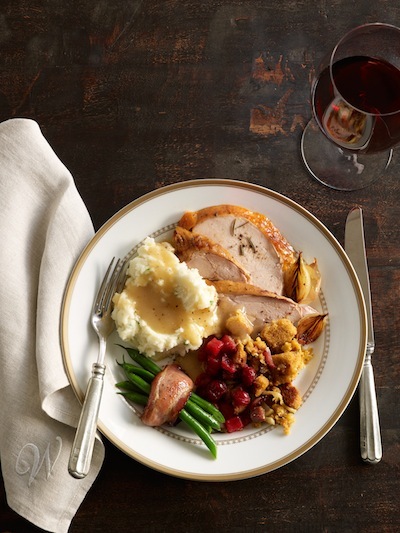 Published on September 19, 2017 in Recipes. 1 Comment Tags: Béchamel Sauce, Ginny, Lasagna, meat ragu, pasta, ragu, Tobia, Virginia. I am staring down the barrel of loosing Ginny. I am trying to be brave, trying not to be emotional and grossly failing. Most days, I avoid mentally ‘going there’, to the irreversible moment where our conversations only remain in my memories. The rational non-emotional version of me knows that I need to let her go. At 104 years old she is tired. And while her decline often feels as if it is accelerating I remind myself that until she was 103, she was remarkably sharp and able to keep tabs on most all of our comings and goings. When I reflect back, I realize that in many ways she has been gradually leaving us. For years after my grandfather passed we had our nightly 6pm calls but those faded away as she forgot how to engage with electronics, in response my father and I migrated to increased visits and she remained happy for the interaction. 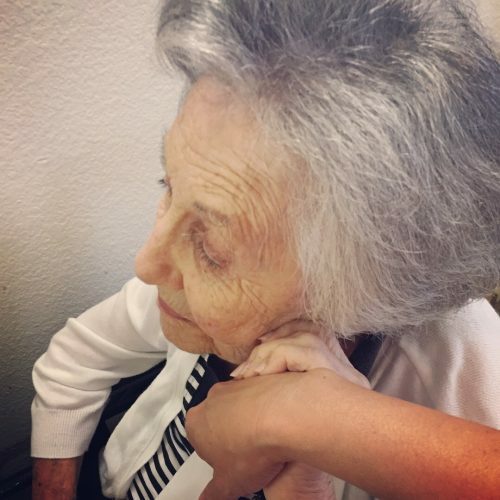 As her physical stability became more limited at 102, she tried to remain engaged by having us tell her stories. 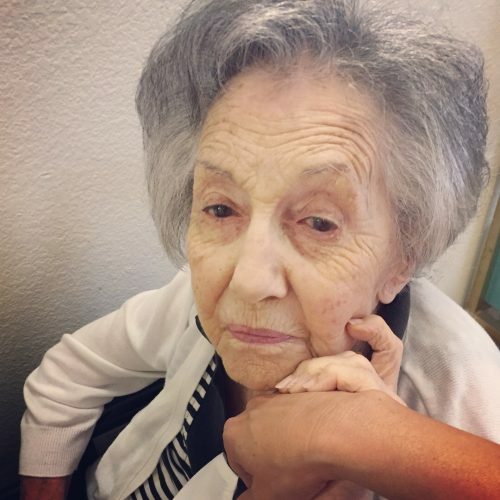 Up until she was 103, we had been girlfriends kibitzing about every day life, but these last few months we’ve seen a rather quick slide backwards in her cognitive abilities as her short and long term memories have been stolen away. Stories and conversations are difficult to sustain, so often times we just sit and smile and hold hands. As I walk into her apartment I am filled with anticipation, as I wonder if she will remember my name. There are visits of complete and total clarity, and then there is the opposite of that. Her dementia has progressed from occasional memory lapses to occasionally remembering key things and people. I look for glimmers of her in her somewhat vacant eyes. And I live for those visits when she calls out my name upon seeing my face, and quickly grabs my hand and holds it to her face and kisses it. I’ve stopped planning the every other week visit with my children as I know they would be crushed to see how much she has changed. They have such wonderful vivid interactive memories of her that I want to hold those sacred for them. I try to get all my tears out before and after each visit. Attempting to mentally prepare for what is the unavoidable and anticipated outcome – yet it NEVER gets any easier to imagine a life without her. I understand that it must be so but in my heart I can’t find the calm acceptance I need to have. Letting go of Ginny, is one of the most difficult things I could ever imagine because against all odds she has been an active participant in all of our lives. I remember when her first great grandchild was born and she wept – happy to have been able to meet this new person and sad that she would never see her grow-up; and yet, she has seen her the first 16 years of her life and the first 14 years of her great grandson’s life – I won’t bore you with the tawdry details of how old she’s seen me grow as that would require numerous Campari’s on my part! 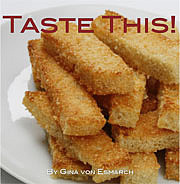 For me Ginny will always illicit food memories. She was a fantastic gourmet cook. She would tell me stories about when she first married and how awful of a cook she was, yet she was determined to become better. Growing up her mother had always done all of the cooking and she and her sister were not allowed to participate for fear of getting dirty. So when she married as a 29 year old, quite late for someone at that time, she was up for a bit of a challenge. My Grandfather’s sister Ida was her guide to better cooking; or at least she was so brutally honest that she encouraged my Grandmother to subscribe to ‘Bon Appetite’ Magazine to up her game. And the headstrong determined Ginny, did just that. It was commonly known by the time that I can recall my birthday party’s at their home on Telegraph Hill that she was an amazing cook, having surpassed both of her sister-in-laws and then expanded into elaborate cakes and cake decoration. Everything she made from pastas to birthday cakes was a work of art. Born in San Francisco, in 1913 Virginia ‘Ginny’ Dora’s parents originated in Northern Italy up near the Alps in Valtellina. 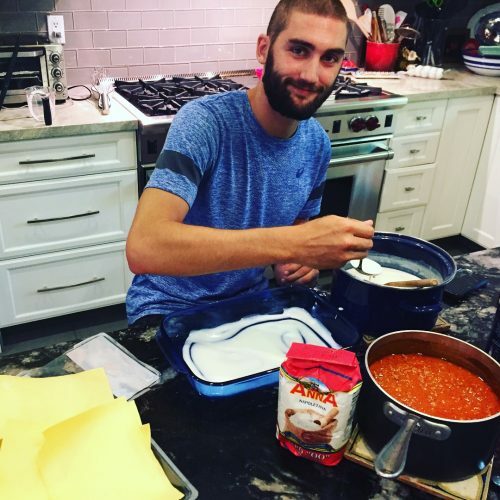 They were proud mountain folk that took pride in their polenta and lasagna. Lasagna was one of the dishes that she prepared that my maternal side of the family never made as it was not as prevalent of a dish where they originated from in Sicily. Ginny had numerous recipes for lasagna, but her favorite was the one she learned from our dear Maria Rosa from Montecatini. 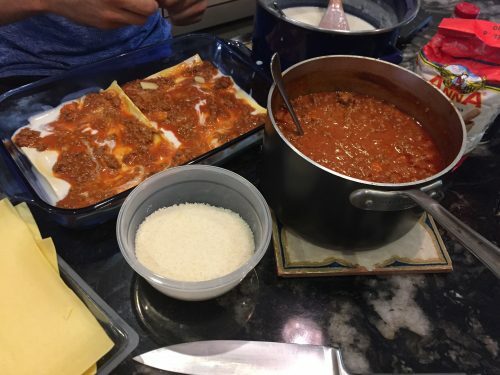 It has been years since I’ve made my Grandmother’s recipe, having migrated to a more American version, but recently we had our good friend from Parma, Tobia, staying with us and he offered to make lasagna. 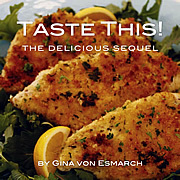 I can tell you, at first bite I was taken back to Ginny’s adaptation of Maria Rosa’s delicious recipe. Without knowing it, Tobia had given me the sensory boost I needed to reconnect and chin-up emotionally. And while I know the road ahead for Ginny will remain filled with a few peaks and numerous nadirs I also know that through the recipes she has shared with me, as well as her passion for cake decoration, she will always be a part of our lives. 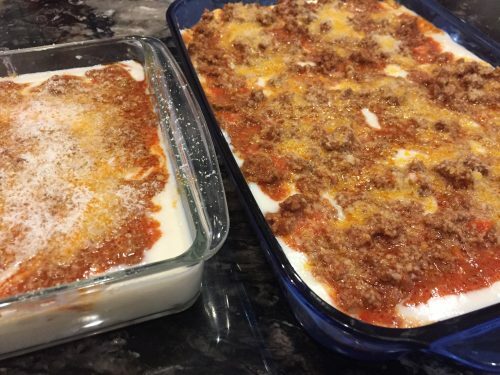 The main difference between American style lasagna and Italian lasagna is the lack of copious amounts of cheese and in its place a buttery layer of béchamel sauce. If you don’t have all day to make your ragu (meat sauce) then make it ahead and allow the flavors to set up for a day or two. And if you want to really leverage your time investment then I recommend doubling the recipe, assembling two lasagnas, and freezing one of these meals to be enjoyed at another time. 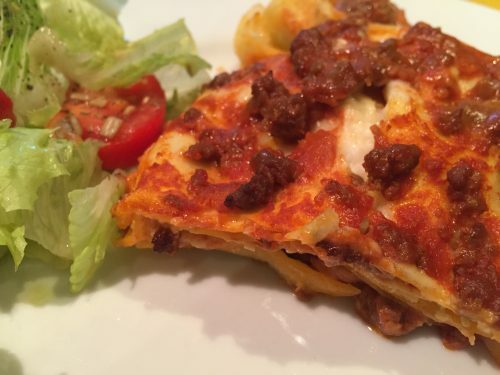 There are three sets of ingredients and directions to this recipe – Ragu, Béchamel Sauce and Lasagna ingredients plus assembly. 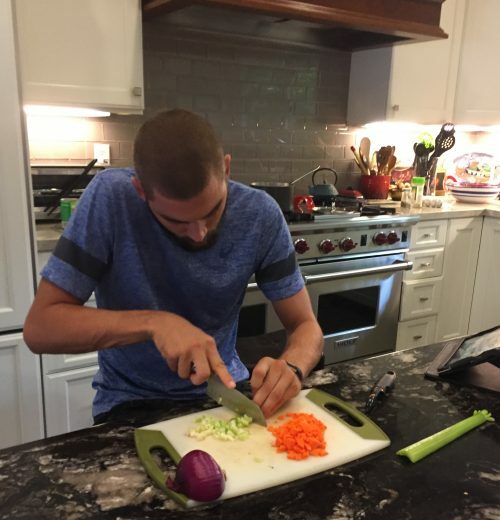 In a medium pot, over medium heat, add olive oil and carrots, onions and celery and cook until translucent. In a bowl, combine the ground beef and sausage and mix until well combined. Then add this into the vegetable mixture. Cook stirring frequently until meat changes color from red to a light gray color. Add in white wine and tomato sauce and bring mixture to a low boil. Once boiling reduce heat and cover with a lid, leaving it slightly offset so that some evaporation will take place. Cook sauce for 2-3 hours, stirring every 20 minutes. 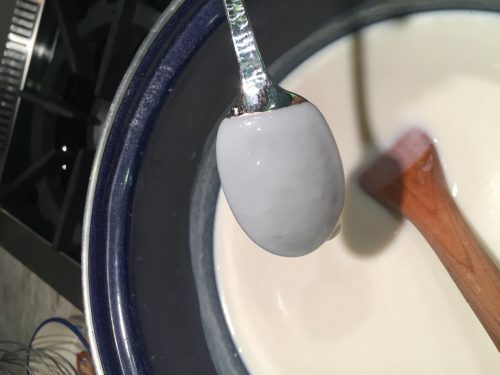 The last 20 minutes of cooking, while stirring, add in milk. In a small pot over medium low heat, add butter and stir continuously until melted. Add in the flour slowly, stirring constantly until well combined and the mixture turns a slightly yellow color. Gradually begin to add in the milk 2 cups at a time, stirring with a whisk. Once all milk has been added continue to stir until sauce noticeably thickens. It should thickly coat the back of a spoon when ready. 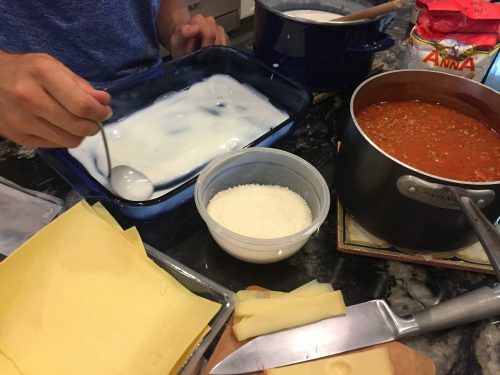 Using a 9×11 baking dish, put ¼ inch generous layer of béchamel sauce, layer the uncooked fresh lasagna sheets next, then béchamel sauce, ragu and then Emmethal cheese and a sprinkle of Parmesan cheese. Repeat for two more layers finishing with béchamel and ragu and a generous amount of Parmesan cheese. Extra sauce can be frozen for use with pasta.